Based on the U.S Energy Information Administration , during January, refinery inputs have declined by 3.2% to reach, as of last week, 15.625 million barrels per day. Conversely, the U.S oil supply has improved: During the past month, oil imports have increased to 7.61 million barrels per day — a 2.8% increase. Further, oil production has inched up by 0.1% Thus, the total supply (comprising of imports and production) has increased by 1.4%. This means, in recent weeks there was a rise in supply and a drop in demand. These recent developments suggest the U.S oil market has loosened in the past several weeks. If this trend persists, it could further cut down the price of oil to reach the low $90. The oil market in Europe has also loosened in the past month, and the EIA estimates Europe’s demand for oil will continue to fall in 2014. 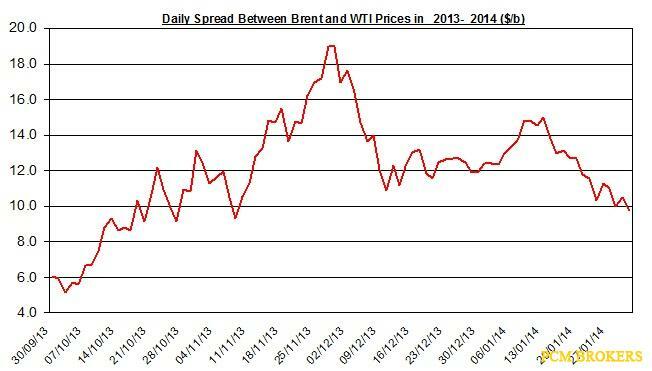 Despite the latest fall in the spread, on a yearly scale the EIA estimates the average spread will be $12 a barrel. In comparison the spread was around $10.8 per barrel in 2013. In 2014, the EIA projects a 13% increase in U.S oil production to reach 8.5 million bbl/d. Conversely, U.S oil consumption is expected to remain unchanged during the year. Moreover, OECD oil consumption is estimated to decline by 0.1 million bbl/d – mainly due to lower consumption in Europe and Japan. Thus, the looser oil market could cut down the price of oil in 2014. In the fourth-quarter, Valero Energy hasn’t improved its operations: Its profitability remained stable at around 5.4%. Moreover, the company’s revenue inched down by 0.8%, year over year. The company’s revenue remained nearly unchanged because the rise in throughput volumes was offset by the decline in throughput margins. Looking forward towards the first quarter of 2014, the company could experience a further rise in throughput volumes but margins are likely to decline. During January 2014, the price of oil was nearly the same to the price of oil in January 2013. If the price of oil remains at its current level, this could suggest oil refineries won’t improve their revenues. But the gap between Brent and WTI has contracted from $17.4 per barrel in January 2013 to $12.5 per barrel in January 2014. Marathon Petroleum , unlike Valero, increased its revenues by 20% during the fourth- quarter. Despite the spike in revenue, the company’s profitability narrowed from nearly 5.7% to 4% in the fourth-quarter. The jump in revenue was due to company’s increase in refinery throughputs by 27%; the higher throughputs were because of Marathon Petroleum’s decision to purchase the Galveston Bay refinery back in February 2013. This higher volume was offset by a 4% decline in refinery margins. For the first-quarter of 2014, however, the recent fall in the gap between Brent and WTI is likely to cut further down these companies’ profitability and revenues. Finally, the recent drop in refinery input, as stated earlier, could also suggest a potential fall in throughput volumes for the above-mentioned companies. Why Silver Isn’t Pulling Up? The price of silver fell during January. Why silver isn’t recovering? What’s up ahead for the silver market? Let’s analyze the recent news that may affect silver (SLV).The drop in silver price has also reflected in the drop in demand for leading silver ETFs such as iShares Silver Trust. During January, the Silver Trust’s silver price decreased by 1.7%. The last FOMC meeting may have contributed to the decline of silver price. Let’s further explore this issue. Last week, the FOMC decided to taper again QE3 from $75 billion to $65 billion; this news pressured down the price of silver. Is Chesapeake Heading at the Right Direction? Chesapeake Energy (NYSE: CHK) will release its 2014 outlook at the end of this week and its fourth-quarter earnings report by the end of the month. Until these two reports will be released, let’s examine how the company has done in the fourth-quarter, compared its performance to leading oil and gas companies such as Exxon Mobil (NYSE: XOM) and Chevron (NYSE: CVX), and see how the recent developments in the oil and gas markets may affect the company’s revenue in the first-quarter of 2014. One of Chesapeake operational changes in 2013 was to increase its oil production. In 2013, the company’s oil production is expected to reach 41 million barrels – nearly 30% higher than in 2012 . For the fourth-quarter, the company’s oil production is estimated at 10 million barrels, which is 13% higher than in the fourth-quarter of 2012. Moreover, the average quarterly price of crude oil was 10.5% higher than last year. Therefore, taking into account these two factors, the company’s oil revenue is likely to rise by nearly 25%, assuming all things equal. In the first-quarter, however, the current price of oil is $95, which is the same price as in 2013. Therefore, if oil price remains at its current level, the price of oil won’t positively affect the company’s oil related revenue. Let’s turn to natural gas. The recent rally in the price of natural gas is likely to augment Chesapeake’s natural gas revenue in the first-quarter of 2014. During January, the average price of natural gas was roughly 35% higher than in January 2013. If the price of natural gas remains at its currently high level, this could result in a jump in the company’s revenue and profit margin. For the fourth-quarter, the price of natural gas was roughly $3.86, which is nearly 9% than the average price in the same quarter in 2012. Thus, assuming all things equal and based on the company’s output in the first three quarters of 2013, the company’s total revenue could rise by 1.3% in the fourth-quarter due to the rise in the price of natural gas. Besides the changes in oil and natural gas, the company has also regained the confidence of its investors and debt holders. This assessment is based on the recent developments in the company’s CDS pricing. In recent months, the company’s credit default swap (five years, in US dollar) has tumbled down from nearly 400 back in March 2012 to 196 as of last week. The current CDS price of 196 means the yearly premium, in case of a default of $10 million of the company’s debt in the next five years, is $196 thousand. 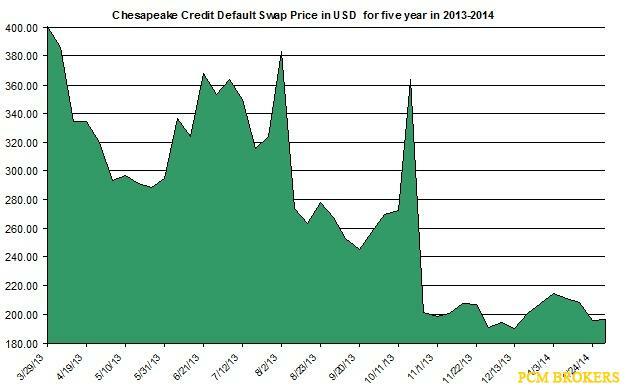 The plunge in the CDS premium indicates Chesapeake is slowly regaining the confidence of its bondholders. The chart below shows the changes of the 5 year CDS price in the past several months (weekly prices). During 2013, Chesapeake took several steps to regain the confidence of its shareholders. These steps include: selling off assets related to natural gas such as Northern Eagle Ford Shale and Haynesville Shale; reducing its financial risk by selling Chaparral Energy , a company that produces oil and natural gas and holds high debt levels , even for this industry – Chaparral’s liabilities-to-assets ratio was 0.78. In comparison, Chesapeake’s ratio was 0.62, and Exxon’s ratio was 0.51. Finally, Chesapeake has also cut down its debt level in the past year: From the first-quarter to the third-quarter, Chesapeake’s debt fell by over $700 million. These steps are likely to cut down the company’s risk and further improve its stand compared to other oil and gas companies. The drop in the company’s CDS is also related to its performance in recent quarters. 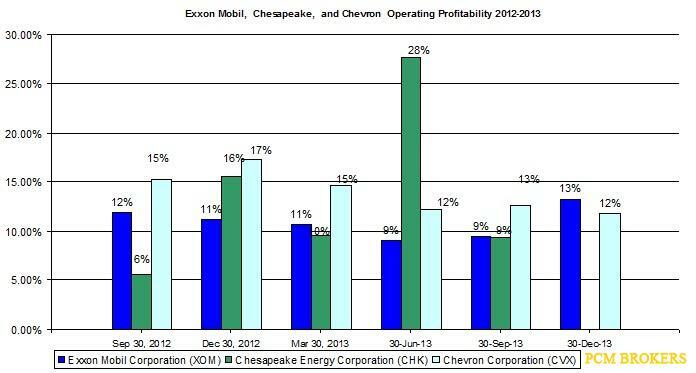 The chart below shows Chesapeake’s operating profit (excluding goodwill charges) compared to other leasing oil and gas companies such as Exxon and Chevron. As you can see, Chesapeake’s profitability, excluding changes in goodwill, was in line with the profitability of Exxon and Chevron. Nonetheless, Chesapeake is still behind these companies in terms of dividend payments. Chesapeake’s annual dividend yield is only 1.3%. In comparison, Exxon offers more than 2.8% annual yield; Chevron pays an annual dividend yield of 3.6%. In the coming quarters, if Chesapeake’s management decides to augment its dividend payment, it could draw more investors towards this company. I think Chesapeake’s management has made several changes that reduced the company’s risk and may improve its performance in the coming quarters. Finally, the recent developments in the natural gas market could benefit Chesapeake’s revenue and profitability in the first-quarter. Will Silver Keep Heating Up? The price of silver rose during last week and reached its highest level this year. Will the silver market continue to rally? Let’s examine the recent news that may affect the price of silver (SLV). The recent recovery of the price of silver has reflected in the rise in demand for silver ETFs such as iShares Silver Trust. During February, the Silver Trust’s price increased by 13.6%, and the amount of silver in the Trust rose by 1.5% to 164.24 tons. Silver related investments such as Silver Wheaton (SLW) also rallied during this month – the stock is up by 19%, up-to-date. Looking forward, the changes in the U.S dollar, gold price, and the FOMC’s policy could be among the factors affecting the direction of silver. Let’s further explore these factors. The decision of the FOMC to taper QE3 in the past two meeting has started to slowly affect the yields of U.S long term securities. Conversely, the price of silver doesn’t seem to be affected by the FOMC’s mini-taper. Silver and U.S long term securities are considered safe haven investments. But the demand for silver as an investment hasn’t diminished, even though the market sentiment seems to have shifted towards risk seeking. The chart below shows the movement of the price of silver and U.S 10 year treasury yields during February. Will Natural Gas Change Direction? The price of natural gas reached its highest level in recent years. The rally of natural gas was mainly due the colder than normal weather and the very low storage levels. Looking forward, will the price of natural gas change direction anytime soon? And, how will the recent rise in the price of natural gas affect the performance of natural gas companies including Devon Energy (NYSE VN)? The recent rally in the price of natural gas is mostly related to the sharp rise in the demand for natural gas for heating purposes due to the colder than normal weather mainly in the Northeast and Midwest. For the 2013-2014 winter, the Energy Information Administration expects the natural gas consumption for heating will be 3.3% higher than last year’s winter. Further, the U.S average heating degrees days, which measure the demand for energy needed to heat a building, will be 3.8% higher this winter than last year’s. Thus, the sharp rise in the demand for natural gas in the residential and commercial sectors has led to high extractions from the natural gas storage. The chart below shows the changes in the natural gas storage and the weekly price of natural gas in the past several years. As you can see, the current storage level is at its lowest level in recent years. Further, the current storage is roughly 40% lower than last year. The extraction season is likely to continue until March-April. The current low levels are likely to keep the price of natural gas elevated. Due to the recent developments in the natural gas market, the Energy Information Administration revised up its estimates for 2014 and predicts the price of natural gas will reach an annual rate of $4.17/ MMBtu — roughly 12% higher than in 2013. The EIA also expects the natural gas production will increase by 2.2% during the year. The consumption is projected to rise to 70.2 Bcf/day in 2014. In the coming weeks, as the temperatures will start to pick up, the demand for natural gas in the residential and commercial sectors is likely to decline. Moreover, the sharp rise in price of natural gas is likely to cut down the demand for natural gas in the power sector. Investors of the natural gas ETF United States Natural Gas (NYSEMKT: UNG) will only partly benefit from the rally of natural gas mainly due to the Contango in the natural gas market, in which the price of long term future contracts are higher than short term future contracts. The Contango in this market tends to reduce this ETF’s value compared to the price of natural gas. A more detailed explanation could be found in a recent article I wrote on this issue. Let’s demonstrate the difference between the performance of UNG and the price of natural gas in the following the chart, in which prices are normalized to the beginning of the year. 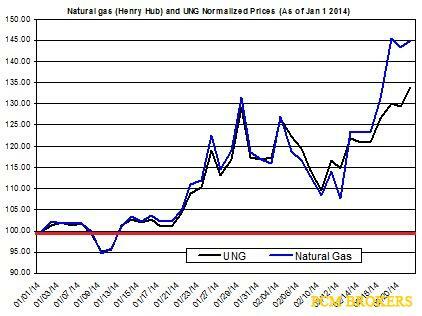 The chart shows the prices of UNG and natural gas have parted ways in the past several weeks. This occurrence tends to develop during the winter when the price of the Henry Hub spikes due to sharp changes in the supply and demand. Over long period of time, this gap is likely to further widen. Therefore, investors should be advised to consider this issue when they consider going long on natural gas with UNG during winter time. Other ways to benefit from the recovery of natural gas is by investing in natural gas related companies such as Devon Energy. The company’s natural gas production declined in 2013 by 6.8% to reach 873.6 Bcf. Conversely, Devon Energy’s oil production rose by 14.7% during last year. Despite this decline in the natural gas production, the revenue from natural gas still accounted for roughly 31% of the company’s total oil, gas and NGL sales in 2013 — a similar rate as in 2012. The company’s decision to acquire GeoSouthern Energy’s assets in Texas’ Eagle Ford shale for $6 billion in cash back in November 2013 is expected to further increase the Devon Energy’s oil and NGL production in the coming years. This decision could also reduce the company’s exposure to the changes in the natural gas market. 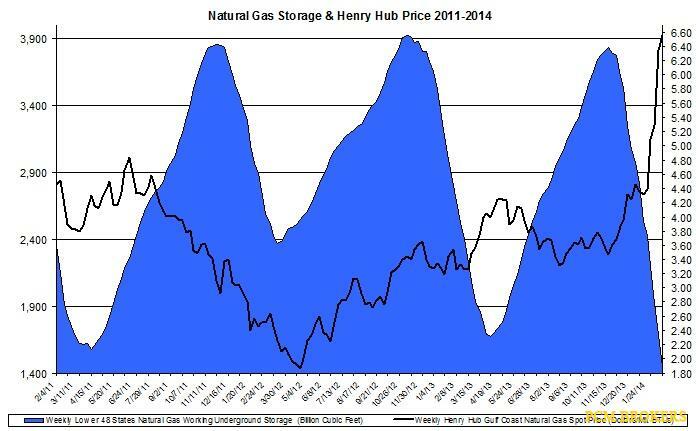 Nonetheless, the recent jump in the price of natural gas is likely to reflect in higher revenue in the first quarter of 2014. Natural gas is likely to remain at its currently high level in the near future. But once the temperatures will pick up in March-April, the price of natural gas is projected to come down. Finally, on a yearly scale, natural gas is expected to be higher than in 2013, which could benefit natural gas companies. Will Silver Change Direction and Fall? The recovery of the price of silver slowed down in the past week; it finished the week above the $21 mark – silver’s highest level since mid-March. But the upcoming non-farm payroll report could change the course of this precious metal. Let’s see why. During the previous week, silver inched up by 0.75%. Further, other silver related assets also increased last week: Silver Wheaton (SLW), iShares Silver Trust (SLV), Pan American Silver (PAAS) rallied by 4.1%, 0.6% and 2%, respectively. This week the U.S non-farm payroll report will be released. In the previous report, 217,000 jobs were added during May, which was inline with the market expectations. The table below shows the changes in the price of silver, USD/Yen and the rise in number of jobs. In the past, the rise in number of jobs tended to lead to an appreciation of the USD and a drop in bullion prices. Moreover, in the past, precious metals and change in number of added jobs had a strong correlation (under certain assumptions). Is Chesapeake Energy’s NGL Strategy Right? The decision of Chesapeake Energy (NYSE: CHK) to increase its production of natural gas liquids raises the question of whether this is the right move for the company, and how will this play impact its bottom line. Also, what are the main opportunities and challenges this move entails? Let’s tackle these issues. Chesapeake Energy expects to augment its NGL production by 63% to 68% during this year. In the first quarter, its output grew by 55%, year over year. Further, the NGL operation expanded by a faster pace than Chesapeake Energy’s oil or natural gas productions during the first quarter. This year, NGL will account for 13% of the company’s total output; back in 2013, it accounted for only 9%, and back in 2012 it was 7%. Most of Chesapeake Energy’sNGL production comes from its Mid-Continent, Eagle Ford Shale and Utica Shale operations. The company’s decision to increase its NGL operations is part of the growing NGL business in the U.S. According to the U.S Energy Information Administration, volume of liquids (including NGL and methane) extracted from wet natural gas wells grew at an average of 7% per year between 2008 and 2013. Other oil and gas producers such as Anadarko Petroleum (NYSE:APC) and Marathon Oil (NYSE:MRO) have also expanded their NGL operations in the past year and are expected to keep doing so in the near term. But the growing supply of NGL may have a negative impact on its price in the coming years. High NGL prices – will they last long? NGL is mostly comprised of ethane and propane. These two commodities’ prices are affected by the cold weather. The harsh winter in the U.S drove higher the prices of ethane and propane, which led to an increase in the price of NGL in previous months. Moreover, the prices of NGL are considered correlated with crude oil prices. In the past several years, this relation with oil gave NGL prices a premium over natural gas. The current price of NGL is still elevated at around $40 per barrel, which is 14% higher than last year. Since the harsh winter conditions have subsided in the past several weeks, the demand for these commodities are likely to come down, which could pressure down the price of NGL. Moreover, in the coming years, the EIA estimates the rise in liquids production will have a negative impact on the prices of ethane and propane, which will also bring down NGL prices. Nonetheless, for now, the current elevated prices of oil are likely to keep NGL prices higher than last year’s levels. Due the premium NGL prices have over natural gas prices (as stated above), this premium also suggests NGL may offer higher profit margins for Chesapeake Energy compared to natural gas. Thus, the company could improve its profitability in the coming years as its NGL production takes a bigger role out of its total output. Chesapeake Energy is making the right move by expanding its NGL production. Nonetheless, the potential decline in prices of NGL could reduce its appeal and thus make this move less profitable in the coming years. Disclaimer:The author holds no positions in stocks mentioned and does not plan to initiate positions within 120 hours of the posting of this article. This article is to be used for educational, research and informational purposes only and does not constitute investment advice. There are no guarantees, expressed or implied, of future positive returns in regards to the subject matter contained herein. Understand the risks inherent in investing before making the decision to invest or consult an investment professional for more information. Reasonable due diligence has been performed in regards to the information in this article. However, the author expressly disclaims any liability for accidental omissions of information or errors in fact. Royal Gold (NASDAQ: RGLD) has outperformed other royalty and streaming precious metals companies such as Silver Wheaton (NYSE: SLW) in the stock market during this year (up to date). What is driving the company’s stock so high besides the recent recovery of the price of gold? Royal Gold expects to sharply increase its attributed production of gold and silver during this year. The table below summarizes the expected attributed production from Royal Gold’s royalty and streaming agreements in 2014 and the attributed output in 2013. As you can see, most of the company’s growth in attributed production will come from its royalty agreement with Barrick Gold (NYSE: ABX) and its Cortez gold mine in Nevada and Mt. Milligan, which is produced by Thompson Creek Metals (NYSE:TC). Further, Royal Gold also expanded its royalty contract on Cortez NVR1 to receive a higher production from Barrick Gold. Conversely, Silver Wheaton doesn’t plan to increase by much its attributed production this year — the company expects to increase its operations by only 0.5% and reach 36 million silver equivalent ounces. Looking forward, Royal Gold will see additional growth in its operations from other developing assets such as Barrick’s Goldrush project in Nevada. Royal Gold plans to receive 1% of net revenue royalty from this deposit. Barrick estimates the project will start producing by mid-2015. Moreover, earlier this year, Royal Gold entered into another royalty agreement with Rubicon Minerals (NYSE:RBY) to partly finance the construction of the Phoenix Gold Project in Ontario, Canada. In exchange for a $75 million investment, the royalty company will receive 6.3% of the gold produced up to 135,000 ounces. Afterwards, it will receive 3.15% thereafter. These types of contracts will further expand Royal Gold’s revenue in the coming years and will keep driving the company’s stock higher. But Royal Gold may receive gold from Barrick Gold’s Pascua-Lama project at a much later than expected date. Royal Gold has a royalty agreement on the Chilean side of the Pascua-Lama mine. Barrick Gold had to delay the construction of this mine at the end of last year and has yet to reopen it. The company’s high burden of debt and ongoing challenges it faces related to this mine might eventually lead it to sell this asset. Nonetheless, Royal Gold doesn’t expect this delay will adversely impact its investment except for the delay in delivery. Despite the low price of gold in the past year compared to previous years, Royal Gold was able to maintain its operating profit margin, as indicated in the chart below. Despite the plunge n the quarterly price of gold in the past few quarters, the company was capable to maintain a hefty profit margin of above 40%. In the past quarter, its profitability rose to 50% — the highest level since the second quarter of last year. If the profitability keeps improving, this trend could further improve Royal Gold’s valuation. The ongoing rise in Royal Gold’s operations through investments didn’t result in a sharp increase in its level of debt. As of the end of March 2014 Royal Gold’s debt-to-equity ratio was only 13%. In comparison, Silver Wheaton’s ratio was 29%. Moreover, Royal Gold has about $646 million in cash on hand, which will allow it to strike additional royalty agreements in the coming months. The company’s healthy balance sheet will keep its financial risk low. Royal Gold is making the right decisions by expanding its operations mainly in the U.S and Canada. These decisions are likely to keep augmenting the company’s revenue; as long as the price of gold doesn’t come back down, Royal Gold’s stock is likely to keep heating up. European bourses declined for a fifth consecutive day, to their lowest level in 2014 as the banking turmoil in Portugal took center stage. Banco Espirito Santo SA led the way in losses as its stock sank 16% on news that Espirito Santo International SA could be requesting for bankruptcy protection in Luxembourg should it be unsuccessful in reaching a debt renegotiation agreement with its main creditors. Banque Privee Espirito Santo suspended trading its bonds and shares today following its inability to make payments of some of the last maturities of short-term debt securities issued by Espirito Santo International. The pressure from the banking sector has led yields in Portugal to rise from their 3.2% low in June to 4.0% today. In fundamental data from the euro zone, economic readings for industrial production in Italy and France disappointed at -1.8% y/y and -3.7% y/y respectively and highlight concern about euro zone growth for the second quarter. Further, deflation risk is accelerating for France with headline consumer rising only 0.%% in June on an annualized basis, below the 0.7% anticipated. This may place further burden on the ECB to ease monetary policy in the near term. The pound has retreated from an intraday high of 1.7166 to trade slightly about the 1.7100 handle as UK trade deficit widened to £-9.204 billion in May from £-8.812 billion in April, largely attributed to weaker exports to the EU which represents just over half of UK exports. The Bank of England in its interest rate decision maintained rates at a record of low of 0.5% and the size of its asset purchase facility at £375 Billion. Despite Bank of England Governor Carney’s hints last month that the BOE may raise interest rates “sooner than markets currently expect”, today’s statement suggest that members of the MPC would need evidence that there is less slack in the economy before voting for a rate hike. A key area that will be scrutinized will be wage growth which has lagged despite subdued inflation. The composition of voting members within the central bank could prove important as the bank has recently replaced a known hawk, Spencer Dale with Andy Haldane who warned of the risks of embarking on a quantitative easing program. Two other members that will participate in the policymaking board next month include Nemat Shafik and Kirstin Forbes, who are relative unknowns. As we head into the North American session, yesterday’s release of FOMC minutes has proven to stabilize markets as disappointing data from China and euro zone has weighed on indices. Trade figures from China released overnight, was much lower than estimates at $31.6 billion with exports and imports both missing the mark. Exports rose 7.2%, against consensus of 10.6% and imports climbed 5.5%, missing expectations of 5.8%. A slower than anticipated recovery could propel the Chinese government to inject more stimuli into the economy. FOMC minutes acknowledged improvements in the labor market, alluded that the risks to jobs, growth and inflation were broadly balanced and confirmed that quantitative easing will end in October with a final $15 billion reduction in asset purchases. In economic data, jobless claims declined to a near seven year low of 304,000 from 315,000 the previous week. Later this morning, we will see the release of May Wholesale inventories expected to rise 0.6%. The Canadian dollar is soft but continues to trade within its recent range, pressured by global outlook for the second quarter. In domestic news, New Housing Price Index declined to 0.1% from 0.2% in May month-on-month, with markets turning their attention to tomorrow’s employment report and next week’s Bank of Canada meeting. Sentiment for USD/CAD has not turned bullish, though a combination of lower oil prices, weaker global growth outlook for Q2, increasing US-CN two year spread and decreasing pressure on the Bank of Canada to tighten policy, could suggest loonie weakness going forward.